Guinea pigs are vegeterians and require a constant source of vitamin C. Like humans, the great apes, the fruit bat and the red-vented bulbul bird guinea pigs cannot manufacture this themselves and so must have it provided in the diet. Without enough vitamin C guinea pigs will show signs of illness and young guinea pigs lacking in the vitamin will grow slowly. In adults, a deficiency will increase the likelihood of skin or respiratory disease, it will also slow the healing of skin wounds. 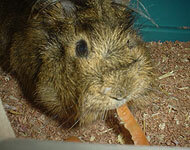 Other essential elements in the guinea pig’s diet are vitamins E and K which is present in hay. Hay must be given to them so to stop them from eating their bedding or chewing each other’s hair.